One of my favorite things about Mark and Vale's parenting skills is their ability to strategically build Oscar's excitement and anticipation for something (i.e. a new sister, snow, Easter, a cruise to Alaska, birthday parties) in a slow, steadily escalating manner. More admirable still is how they manage to execute on the grand finale in a way that has yet to disappoint Oscar, let alone all the other "big kids" that get to witness... live vicariously... shamelessly indulge in all aspects of the excitement and fun. I could tell something big was coming when I witnessed the Star Wars seed being planted sometime in the early summer. 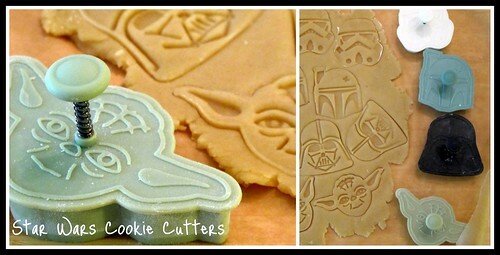 When I came across these Star Wars Cookie Cutters while flipping through the Williams-Sonoma catalog, I knew it would only be a matter of time before these little gems would become desperately appropriate and necessary. 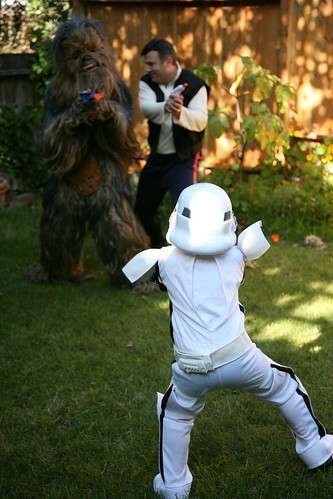 Alas, Vale's crafty invitation for Oscar's 5th Birthday arrived in my inbox. Jackpot. 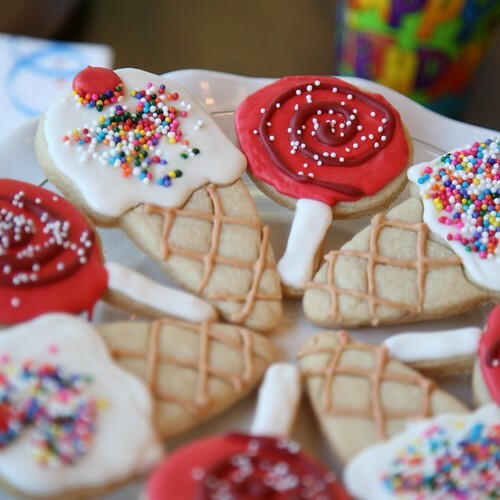 Practice makes perfect with these cookies. I was starting to get better with each cookie I decorated, but I still could stand a little more practice. That shouldn't be a problem, though, as I plan to get plenty more miles out of these cookie cutters over the years. 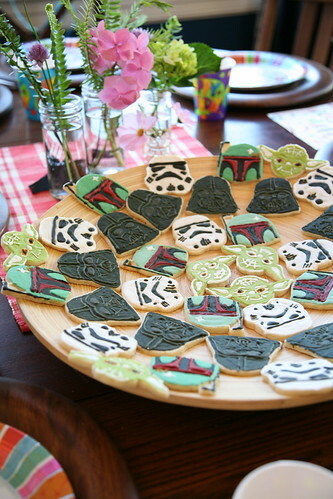 Here are some snapshots of the cookies, but more exciting are the characters* that came to life for Oscar's Star Wars Party, which inevitably developed into a full-blown costume party. 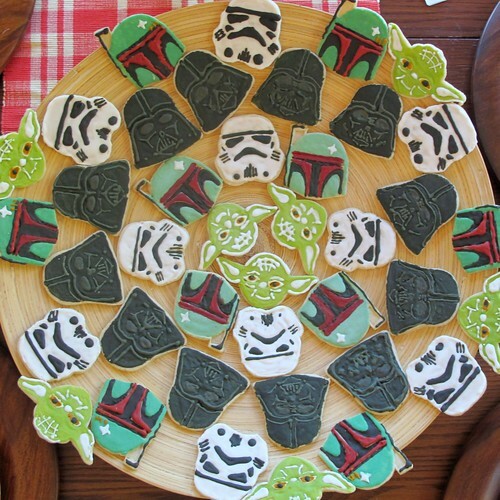 I also decided to make some cookies for the girls at Oscar's party that might not be as into Star Wars as the rest of us. I know some of you still might be asking yourself, "What about Georgia? 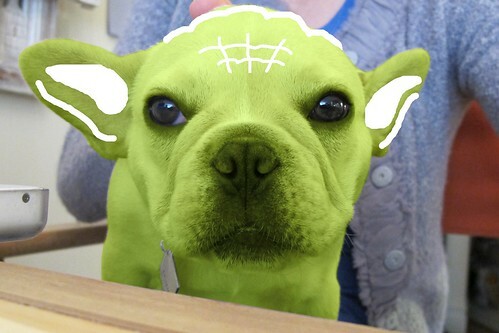 How does she fit her way into this one?" To that, I answer: Duh. 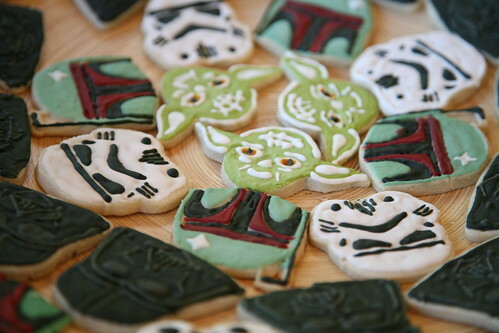 For more really cool, creative star wars cookies... check this out.